Sully Erna Les Paul Studio - Ebony, LP-Shaped Guitar from Gibson belonging to the Les Paul Studio 2013 model. 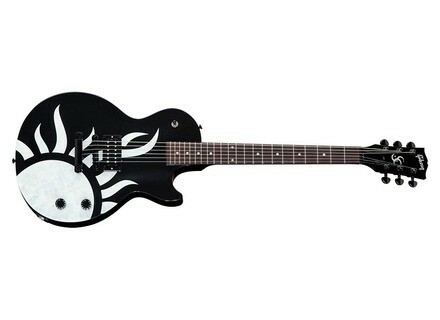 Gibson releases a new Les Paul Studio guitar signed by Godsmack frontman, Sully Erna. The Sully Erna Les Paul Studio is easily recognizable by its Ebony finish with a white sun on the top (emblem of the band), its two stars inlaid on the 12th fret, the artist's Moon and Star logo inlaid on the headstock and the signature on the truss rod cover. Also new on this guitar is a built-in Flanger that will be activated via the push-pull volume knob and a kill switch in lieu of the traditional pickup switch, for this model has only one '57 Classic Plus bridge pickup. The rest of the specifications include a mahogany body with a carved maple top, a set-in mahogany neck with a rounded 50's shape, a rosewood fingerboard with Dot inlays and 22 medium jumbo frets, Grover Kidney tuners with a 14:1 ratio, a Tune-O-Matic bridge and Stop Bar tailpiece. The push/pull volume knob is completed by a tone pot and the hardware is black. Wild Customs Crocoaster II guitar Wild Customs introduces its own vision of the Telecaster with the Crococaster II, a guitar that is entirely manufactured in France. New Gibson Black Beauty Anniversary edition The Gibson Custom Shop celebrates the 20th anniversary of the Historic Reissues Series with 3 guitars, including a new 1957 Black Beauty edition. Free drum loops for the EHX 45000 Electro-Harmonix offers the owners of its 45000 looper pedals a drum loop collection.